According, that is, to Dr Semir Osmanagic. 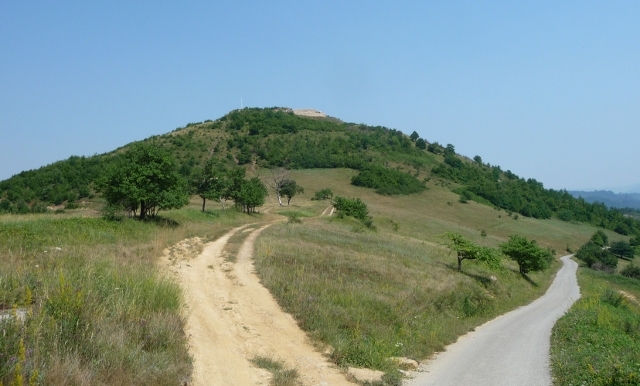 Dr O was the discoverer of the Bosnian Pyramids in early 2005, a valley containing at least four pyramids, two sets of underground labyrinths and a temple. I say “at least”, because it’s many thousands of years since they were built, and archaeological excavation is still under way. 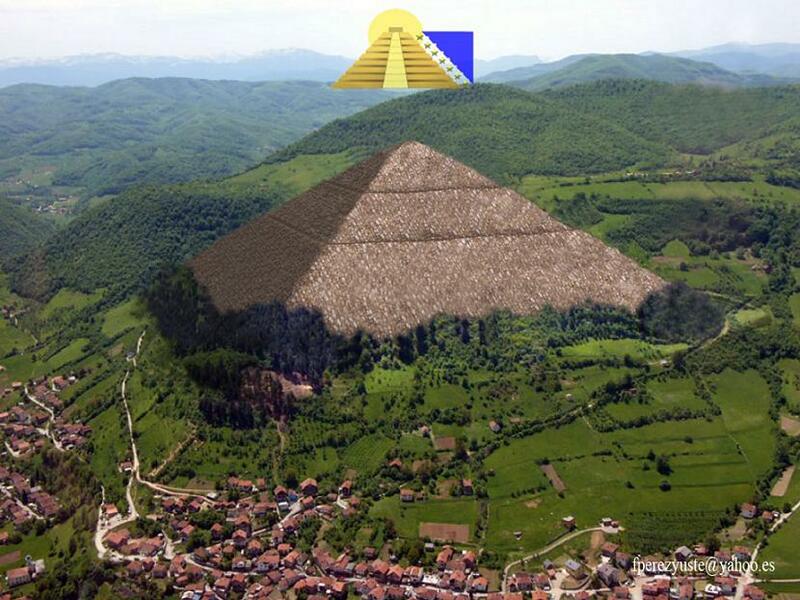 The three main pyramids – the Pyramid of the Sun, the Pyramid of the Moon and the Pyramid of the Bosnian Dragon – may just look like perfectly natural hills to the layman or sceptic, but Dr O assures us that deep beneath the covering of soil, they are actually man-made pyramids, the work of a hitherto unknown early culture. The main pyramid, the Pyramid of the Sun, is the world’s biggest pyramid, no less – at 220m high, it dwarfs that of Cheops – a mere 146m high. With the 190m Pyramid of the Moon, that means that this valley just north of Sarajevo contained the world’s two largest man-made objects for many thousands of years. Image linked from “BlastBeatWorship” blog – click to visit. 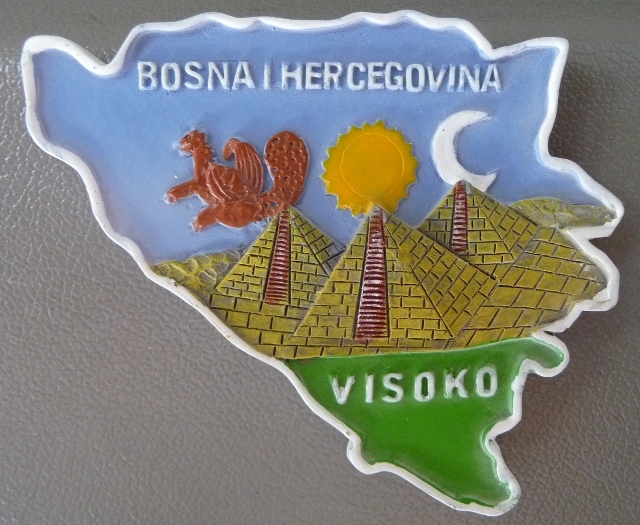 We first heard about the pyramids from a pair of Swedes we met near Kotor. They’d been to see them, and been fortunate enough to have a guided tour by Dr O himself. They were very enthusiastic, and assured us that our views of prehistory would indeed be changed by a trip there. Dr O had carefully explained to them exactly how the pyramids were built by a civilisation some time around 12-10,000BC. This was a time when conventional anthropology claims that there were no sophisticated civilisations about, only basic hunter-gatherers somewhere in the early stone age. So who were they? Were they predecessors of the Illyrians? It’s possible, but there’s little mainstream evidence of the Illyrians for at least another 8,000 years. The pyramids were built to gather energy from space, focusing and harnessing incredible amounts of power – for what purpose, it’s unclear. Mainstream science even now cannot comprehend the secrets of our ancestors, it seems. Underneath the pyramids and the surrounding land, a complex network of underground lakes and tunnels provide further evidence of a very complex civilisation. For some unknown reason, though, everything fell into disuse later, with many of the labyrinths being blocked up by a later (and also unknown) civilisation, around 5-6,000 years ago. Archaeological work to clear the thousands of years of soil from the tops of the pyramids is complicated by the presence of the ruins of a medieval citadel, Visoki – this has been used by archaeologists with a more traditional view of history as a handy excuse for firm opposition to Dr O’s excavations on the hill. Or perhaps, as Dr O claims, it’s that they don’t want the whole basis of their careers so thoroughly debunked? Whilst we waited for a tour of the labyrinths, we had a good opportunity to have a flick through some of Dr O’s books on the pyramids and on other of his radically different explanations of prehistory. Several chapters of these books are devoted to explaining exactly why the more conventional views held by his opponents are biased and based on political motivations. It’s all very enlightening. We arrived at the site and followed the signs for the Pyramid of the Sun. With Nathan & Anna following, we pointed our van and their Ginny up a long, winding, steep, narrow and very overgrown track, finally arriving at a clearing on top of a ridge. Just behind us, a footpath climbed up to the top of the pyramid itself. We clambered up, to where the ruins of Visoki lay – not substantial ruins, it has to be said – maybe there is something in the argument in favour of sacrificing them for a clearer understanding of such a world-changing discovery? The views around us were wonderful, miles and miles in all directions, especially towards the other pyramids. Unfortunately, we had no equipment with us to enable us to check out Dr O’s explanations of the strict geometric rules which define the positioning of the pyramids. Nor, unfortunately, did we see the beam of energy many of Dr O’s images illustrate soaring skywards from the summit of the hill. There was a flagpole, though. After we headed back down to the vans, we were told about the labyrinths, further down the road we were heading. We’d been very surprised to find no information or guide at the pyramid – and now it became clear why. The labyrinth complex is currently the centre of attention of Dr O’s pyramid foundation, with extensive cleaning work – absolutely not digging, merely cleaning, we were assured – being undertaken by a seeming army of volunteers. These volunteers come from all over the world to spend two weeks at a time working, with no remuneration – not even food, accommodation or travel expenses paid. The only reward they get for their hard work is the reassurance that they’re helping to progress our knowledge of the world in the face of overwhelming establishment scepticism and oppression. Guided tours were available, but – unfortunately – it appeared that the guides were all busy with other groups when we were there. We waited, along with several others, for one to reappear and explain everything to us – but, eventually, we had to accept that time was running out for us and that we needed to be heading onwards. Nathan and Anna were staring at their Bosnian border insurance policy expiring the next afternoon, and wanted to see Mostar before they left. We reluctantly received a refund on our tickets and hit the road. It’s a pity, because the leaflet we were given did make the labyrinths sound fascinating – it’s still unknown as to how long they are in total, but tens of kilometres have been located so far. Not all of those are accessible as yet, of course. Let’s just hope that the cleaning work undertaken is more succesful than that undertaken in the other set of tunnels – work started in 2006, but by 2007 had to be abandoned due to vast water ingress flooding the freshly cleaned pre-existing tunnels. The information we were given explains how the pyramids and the tunnels have absolutely no detectible amounts of various kinds of negative energy present, leading to them being described as “some of the most secure sites on the planet”. 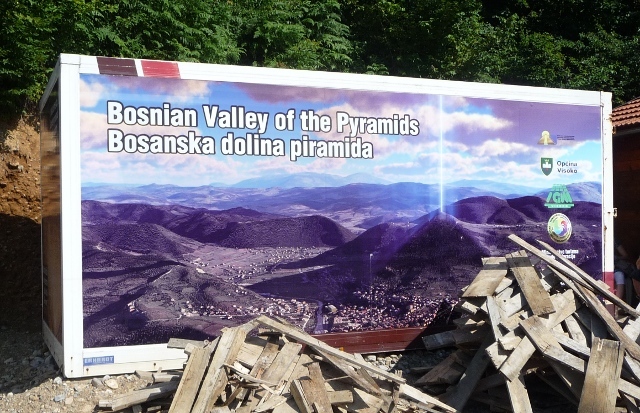 Let’s just hope that the conclusion of 2011’s Second International Scientific Conference on Bosnian Valley of the Pyramids, that “history books need to be changed due to existance, age and purpose of this complex” is taken to heart by the hitherto sceptical establishment. It really only leaves me with one question. On the fridge magnet we bought, why are the three pyramids illustrated with a picture of the sun, the moon, and a squirrel? This entry was posted in Art & Culture stuff, By Country - Bosnia, Wildlife stuff. Bookmark the permalink. That’s brilliant! You were very lucky to learn about this remarkable information. Så ni kom ihåg vårt tips och ni verkar lika förundrade som vi. Kul att ni kommit så långt.